Mobile devices now constitute the majority of web traffic globally, and consumers are embracing mobile banking in record numbers. 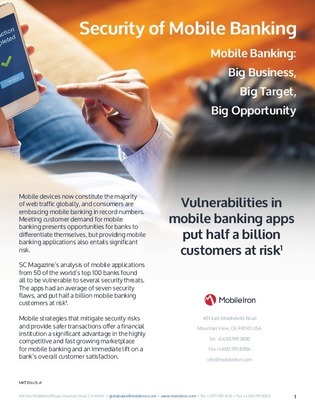 According to an analysis of mobile applications by SC Magazine, 50 of the world’s top 100 banks were found to be vulnerable to several security threats, and their apps had an average of 7 security flaws – putting half a billion mobile banking customers at risk. Find out how banks can overcome the barriers to mobile banking security and respond with secure mobile banking applications.